The PTO is proud to sponsor "Dinner for DAUGHTERS!" Your family may choose a day (or multiple days) to prepare and deliver a meal to the Sisters at the St Joan of Arc convent to enjoy. It is a small way of showing our appreciation for all that the Daughters of Mercy do for us and our children each day! 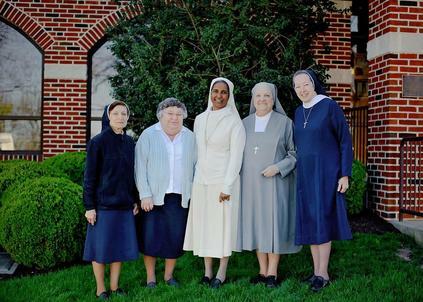 There are 3 Sisters living at the convent. Meals may be delivered between 3-5 pm for dinner at 5 pm (except for Sundays when they eat at noon)! They are easy to please and are so happy to receive home cooked meals and to get a night off from cooking! The only "special request" and dietary restrictions are that they prefer mild dishes (nothing too spicy!) and no mushrooms or iceberg lettuce. And please remember, NO MEAT (fish OK) on Ash Wednesday & Fridays during Lent. Please email Sr. Eileen at sreileen@stjoanhershey.org as soon as possible (before your date) to let her know that you are scheduled to brig a meal and to coordinate drop off time, etc.